For the next week Creative Producers International makes Tokyo our home as we embark on the second Lab of the programme, almost exactly a year after it all began. 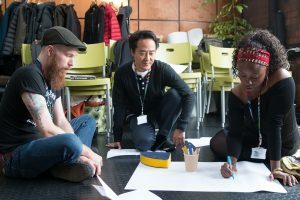 The Watershed team, advisors and our brilliant cohort of Creative Producers have all come together in Japan to take part in talks, workshops and discussions led by a variety of Japanese and international creative leaders, as we continue to explore how creativity can inspire real change in cities around the world. You can learn all about our cohort here. The Tokyo Lab will allow the Creative Producers to experience some of the innovative cultural work being produced in this amazing city and think about their own work in a dynamic international context that, for the majority, is vastly different to their own. We will also reflect on our journey together over the last year, and share the knowledge and skills that have been inspired by the programme. We are also producing our first Making the City Playable conference to take place outside of Bristol, AND a day long lab for Japanese Creative Producers. And if that isn’t enough, we are also producing the Playable City Tokyo Residency 2018, which was awarded to Sophie Sampson and Tom Metcalfe. This is a new programme is produced by Watershed in collaboration with the British Council, JKD Collective Inc and Rhizomatiks, and is supported by Arts Council Tokyo, Tokyo Metropolitan Foundation for History and Culture. We are incredibly excited to get going and we will update you on our Tokyo adventures very soon! If you would like updates on Creative Producers International please sign up to our Playable City mailing list here.